Whether you are a top home chef or just looking to eat healthier, a meat grinder can help. And, of course, you want to make certain you are purchasing the ﻿best meat grinder available to you. Grinding your own meat can help you lower your grocery bills, reduce your consumption of dangerous additives, and allow you to enjoy some very tasty meals. What are some advantages of grinding your own meat? You can pick how thick you want to grind, you know exactly what is in your food, you can create dishes that might not be possible with store-bought meats, and you can prepare fresh game for consumption. You can even create healthier, raw pet food for your furry family members. 2.1 How Much Can it Grind? 2.2 What Are You Grinding? 2.3 How Much Can You Spend? 2.4 How Heavy Is it? 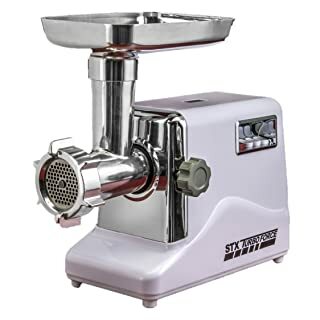 After having reviewed many different meat grinders, our pick for the best is the STX INTERNATIONAL STX-3000-MF Megaforce Patented Air ﻿Cooled ﻿Electric Meat Grinder. It offers the best exchange of performance and usability for price and is ideal for both those who wish to grind meat for meals on a regular basis and those who simply need it for special occasions. But does this mean it is the right choice for you? Not necessarily. There is a lot to consider before you buy. Read below to learn more about what to look for, as well as details on our picks for the top five best meat grinders. Unless you are a professional chef, chances are you don’t know too much about meat grinders. And that means that you are likely going into the purchase feeling pretty blind. To help you make sense of meat grinder reviews, let’s take a look at the important features to consider. The smaller the grinder, the less it can grind at one time. This means that if you have a lot of meat to grind—such as when processing game you have hunted—you can expect it to take longer with a smaller grinder. In addition, the motor may require breaks to cool throughout the process. Larger grinders are able to process large amounts at once, and their motors are usually designed to go longer without needing a break. For big batches, a #12 or #22 size grinding head is best. However, most home chefs will do just fine with a smaller meat grinder. If you are just looking to make food for the family, then this isn’t much of a concern, assuming you are using meats like beef, pork, and chicken. Tougher meats, such as wild boar, may require a more heavy-duty grinder. And if you are looking to make raw pet food and you need to be able to grind bones, you will need to look for more industrial grinders—generally #22 or #32 size grinding head. Chances are you are you need to stay within a specific budget when purchasing a meat grinder, so when looking meat grinder reviews, price is the first thing you look at. While there are meat grinders available for under $100, these tend to be small, lack special features, and are often manual, not electric. Expect to pay in the range of $150 and up for a quality meat grinder. If looking for a more industrial grinder, you can figure on paying $350 or more. But do not let the price put you off the purchase. A quality meat grinder will save you money over time, and not having to replace it every year will also cut down on the costs when compared to lower-end models. While we have already considered size, another thing to think about is weight. If you are going to grind a lot and your grinder will have a dedicated spot on the counter, this won’t matter as much. But if you need to store your grinder away, you will be lifting it every time you use it. Some grinders weigh 50 pounds or more, so be sure to check the weight of your grinder before making an online purchase. The extras and accessories to look for in a meat grinder will depend on what you are looking to make using it as well as how you want to care for it. Below are some extras and accessories to look for. Stainless Steel: Stainless steel is a great option for those who want an easier time cleaning their grinder accessories, as stainless steel is dishwasher safe. However, it is more expensive than steel or aluminum, and it is heavier. 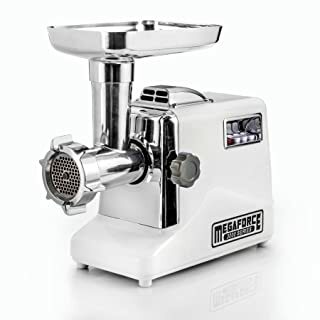 Sausage Attachments: If you are wanting to both grind meat and make sausages, you need to make certain the grinder Stainless Steel: Stainless steel is a great option for those who want an easier time cleaning their grinder accessories, as stainless steel is dishwasher safe. However, it is more expensive than steel or aluminum, and it is heavier. You purchase comes with these attachments; not all grinders do. 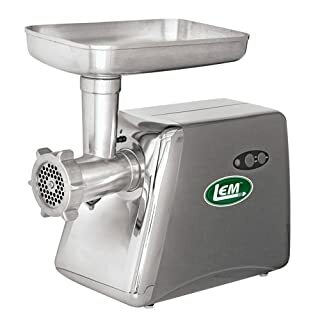 Meat Tray: This is the part that holds the meat in place before pushing it into the feeding tube; this is standard on meat grinders, but some manual models do not have it. Meat Plunger: This is a tool that you use to safely push the meat down the feeding tube. If your grinder does not include it, you will need to purchase it separately. Grinder Plates: These are flat plates that give you control of the thickness of the grind. Some meat grinders will only come with one or two; others will offer more, giving you greater variety. Out of all the meat grinders we looked at, this one offered the best features for the price and was also the one we felt was best suited to your average home chef. It features a cooling system that is designed to reduce the strain on the motor, extending the life of the grinder. It offers 1200 watts of power when on its normal settings and 3000 watts of locked motor wattage. Combining the wattage with the cooling system, you will be able to use this grinder for processing large amounts of meat. This grinder uses a size #12 grinding head, which is larger than your average home grinder. It is made from polished, food-grade cast aluminum for strength; however, this means its main parts are not dishwasher friendly. It comes with 3 stainless steel cutting blades, 3 sizes of grinding plates, a sausage stuffing plate, and 3 sizes of sausage stuffing tubes. The blades can be washed in the dishwasher. Our next pick is quite similar to our number one choice, but it doesn’t have quite the same features. This meat grinder starts out at 800 watts of power during normal use, though it can also get up to 3000 with locked motor wattage. It does not offer the cooling system of the model above, so it is more likely to need breaks when processing large amounts of meat. It has a #12 grinding head and the main parts are made from 100% polished, food-grade cast aluminum. As with the model above, this means that the main parts are not dishwasher safe. It comes with 3 stainless steel cutting blades, 3 sizes of grinding plates, a sausage stuffing plate, and 3 sizes of sausage stuffing tubes. This grinder is ideal for those who need to process large amounts of meat, particularly hunters. It is designed to grind 360 pounds of meat in an hour without the motor needing to shut down for a cool off period. It has a #12 grinder head, so it is able to take in quite a bit at once. It features stainless steel motor housing, metal gears, and a heavy-duty handle to make it easier to move. And that handle is quite needed, as this grinder comes in at 47 pounds. 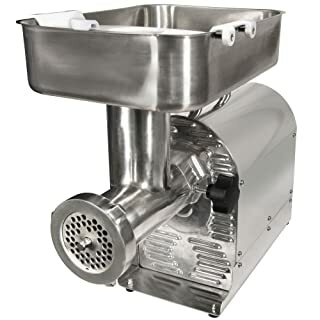 Among its special features and accessories are a permanently lubricated motor, built in circuit breaker, stainless steel knife, head, auger and meat pan 11 1/2" x 8 1/2" x 2 1/4" deep, stainless steel coarse (3/8"), fine (3/16") and stuffing plates, three stuffing tubes (3/8", 3/4", 1-1/4") and meat stomper. This meat grinder will not be the best meat grinder for most homes. However, if you are looking to process large amounts of meat throughout the year—not just during hunting season—or you want to sell your products, it is a good choice. It is also a great option for those making raw pet food, so if you are buying a meat grinder to keep Fido healthy, this is the meat grinder for you. It features an extra-wide, offset throat, allowing you to use larger grinder heads—up to #32—while facilitating faster grinding speeds. It has a permanently lubricated, air-cooled motor that does not shut off due to heavy use. It has a hand guard for safety when using the larger grinding heads. 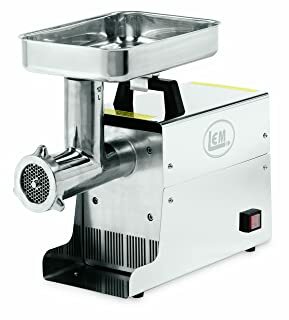 It also offers a stainless steel grinding knife, two grinding plates: coarse (7mm) and medium (4.5mm), a set of three four sausage stuffing funnels, a high-speed stuffing auger, a stuffing star/spacer, and a solid, heavy-duty stomper. If you buy this, be ready for some heavy lifting, as it weighs in at 66 pounds. This grinder is ideal for hunters as it is good at processing large amounts of meat, but might not hold up if used constantly over an extended period of time. It has a 575 watt rating and is able to process about 2 pounds of meat per minute. Set up is fairly quick and at 11 pounds, it is easy to move around and store. However, with a grinder head of just #8, it is the smallest on our list. It comes with 2 stainless steel plates, 1 stuffing plate, 1 grinder knife, 1 stuffing tube - 7/8", and 1 meat stomper.